You're too late to win a prize, but you can still test your knowledge of McDonald's controversies. Only one person got all 22 questions right in the prize-giveaway. And he wasn't called Ronald. Test your knowledge of McDonald's and the nonsense their idiotic executives come out with. Get all the questions right and you could win a Degree in Hamburgerology from Hamburger University. Sample Question: Why is coca-cola nutritious? Answer: Because it is "providing water, and I think that is part of a balanced diet". (David Green, Senior-Vice President of Marketing, McDonald's USA. A possibly over-optimistic animation forecasting the future of the planet. (Multiframe gif). This 30-second clip from the prize-winning documentary 'Jungleburger' is a key piece of evidence from the McLibel Trial. It shows the Marketing Director of a meat processing factory in Costa Rica admitting he supplied McDonald's. Costa Rica is a country whose tropical forests have been devastated in the last 40 years by cattle ranching. Some months ago, an anonymous package arrived in the post. It contained a photo of an unsuspecting McDonald's billboard that had been subverted to show the McSpotlight URL. We scanned the photo and put it on the site but soon had to create a new section to home further. Additional contributions are always welcome, please send in photos to our PO Box or in electronic format by email. Helen Steel - McLibel defendant on how and why she has fought this battle for over 5 years. Dave Morris - Helen's co-defendant on life, McDonald's and the capitalist way. Ronald McDonald - The real McCoy speaks out about McDonald's double standards. Vandana Shiva - India's leading ecological campaigner on why her country resisted McDonald's invasion. A huge selection of cartoons which have appeared in magazines, newspapers and leaflets all over the world. The gallery is split into sections on ; McDonald's, McLibel, McSpotlight, BSE etc. 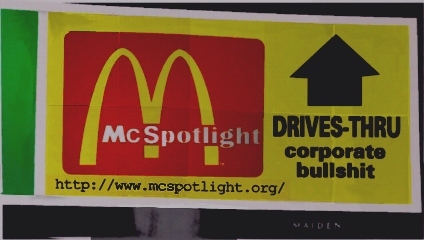 Let the McLibel defendants take you on the Official McSpotlight Guided Tour, pointing out the key pages and features of the site, or check out our Guided Tour of McDonald's corporate website - McDonald's site and our detailed criticisms side-by-side on your screen (using Frames). 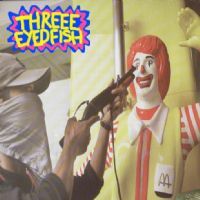 An Anti-McDonald's Rap song by Western Autralian group Threee Eyed Fish. Note: If you are having difficulties downloading, right click and "Save Target as" to save the file to your local machine.